Imagine this scenario. Someone in local government – say, West Coast or Northland – goes on one of those promotional trips overseas to a “sister city” that city councillors are prone to make, and somehow he/she links up with a foreign investor keen to use the resources (and cheap local labour) the region may have to offer. Everything is going just great until someone in central government gets wind of the project, and belatedly realizes – omigod, this will have major environment repercussions – and authorizes an environmental impact assessment that proves such fears are justified. It therefore kills the project. It is at that point the foreign investor would be able to sue our government successfully for compensation, under the kind of investor state dispute settlement (ISDS) mechanisms contained in the Comprehensive and Progressive Trans Pacific Partnership trade deal. None of the assurances made by Trade Minister David Parker yesterday appear to cover the scenario outlined above. Sure, it’s fine and dandy that Parker claims to have won assurances that government contracts cannot be subject to ISDS responses, and that he has negotiated some side letters with an as-yet undisclosed number of other CPTPP member nations besides Australia, to that same effect. Unfortunately, all that is only window dressing. The main risk is not when governments renege on deals that they have signed with foreign investors. The problems arise when governments try to invoke over-riding national interests with respect to deals to which they were not an initial party. Having assurances with other governments, or side letters with other member nations is all well and good – but would an aggrieved foreign investor or multinational company be likely to genuflect to a side letter between politicians, if it effectively circumscribes their right of redress, for what they would regard as a breach of contract imposed from outside, by government fiat? Hardly. Trade experts will recognize the investment scenario outlined above is not fanciful. It is exactly what happened in the notorious Bilcon case in Canada under the ISDS provisions of NAFTA. In that case, an impoverished region within Nova Scotia province invited a US company called Bilcon to build a quarry and create 30 local jobs. When the federal government carried out a review that showed considerable environmental damage would ensue, Bilcon sued under the ISDS rules and won a huge compensation award, which the Canadian government is still struggling to find a way to contest. Unfortunately, his belief that the government enjoys an unimpeded ability to regulate its own contracts and its own environmental programme still does not address the question, and the situation, that had been posed. Governments can intrude on pre-existing contracts at their own risk. No one doubts the good intentions. Yet as Canadian international trade lawyer Barry Appleton told RNZ back in the late 1990s (when foreign investment rules were first being proposed in international trade deals) politicians often make commitments within trade deals, without realizing the full implications of what they are signing away. Appleton should know. Years later, he led the legal team that won the Bilcon case. The striking thing about the MFAT estimates is how small the gains stand to be for New Zealand. All these years of expensive negotiation and rancorous public debate… and this is the payoff? The gains for the 11 member CCTPP deal fall between 3% to 1% of GDP, or between $1.2 to $4 billion by 2030, when the deal is finally and fully in effect. As many critics of the deal have long argued, this kind of return is what a mere currency fluctuation of a few points on the dollar would deliver. Overall, MFAT estimates that the tariff reductions won under the CCTPP deal stand to deliver benefits of $222 million per annum, at least. Yet even the potential gains from greater access for our beef exporters to the Japanese market have almost certainly been overstated. That is mainly because – at best – this deal merely levels our playing field with Australia, whose beef exporters have enjoyed a privileged tariff level for several years, under its own separate bilateral deal with Japan. Yet the CCTPP will level the field for other beef exporters too, such as Canada. Evidently, Canada also has high hopes about its potential payoffs from the Japan beef market, too. Canada exported $115 million worth of beef to Japan in 2016. The Canadian Cattlemen’s Association believes the deal will increase Canada’s beef exports to Japan by $200 million a year in the short term because of cuts to Japanese tariffs. Right now Japan has a 38.5 percent tariff on Canadian beef, which can increase to 50 percent under certain circumstances. The tariff will drop to nine percent over time, thanks to [CC]TPP. So, if the beef market access is the crown jewel of our alleged tariff reduction gains from the CCTPP, the realities of market competition on the ground are likely to put a considerable dent in the rosy estimates delivered by the MFAT modeling. As this column pointed out two years ago, the MFAT modeling has long been suspect, and its calculation of the benefits of the original TPP deal came under sustained attack in 2016 from UN economic modeling expert Jeronim Capaldo and his team at Tufts University. If trade policy provides an incentive for firms to cut unit labour costs further, in order to become more competitive on global markets, the labour share of income will continue to fall. This has serious consequences for the economy. With a shrinking share of total income, working households encounter increasing difficulties in purchasing the consumption and investment goods that make up domestic demand. As a result, the economy becomes increasingly dependent on debt, external demand or both. Income concentration may generate economic instability. In order to preserve their market shares, producers in each country will have to sell at lower prices, and thereby cut costs. Specifically, we assume that this process will lower nominal unit labour costs, the main factor in total costs, through the combined actions of business managers and policymakers who negotiate lower wages (or limit their growth in the face of growing prices and productivity) and introduce more capital-intensive technologies. The second dimension of international competition that the TPP will affect is capital flows. By facilitating cross-border capital movements, the TPP will push firms and other borrowers in each country to provide higher returns in order to avoid losing investors to other countries. For a given level of economic activity, a higher profit rate requires a higher profit share of total income and, therefore, a lower labour share. At the same time, it is generally recognized that inflows of foreign capital depend on a country’s fiscal policy (as summarized by its government deficit), although the link between investors’ preferences and constraints on government expenditure is seldom explored in empirical models….Since all TPP countries will want to preserve their market shares, we assume that they will engage in a race to the bottom, pushing labour shares downward across the whole TPP bloc. In that respect, the TPP – and the current CCTPP is no different in this respect – would function as a transnational scythe to push down labour’s share of wealth across all the participating member countries. It will do much the same to those countries in the Asia Pacific not currently part of the bloc. Where does that leave us? Hopefully, with a more balanced debate on trade, and one that encompasses both its genuine benefits and its equally as real downsides. Otherwise, if we insist on living in denial about the risks that’ free’ trade poses, we will almost certainly be hit by them. Ultimately, why should we trust the same sort of people who told us the 1980s economic reforms would likewise be a win/win for all of us? First, the CGE model used excludes, by assumption, TPP effects on employment and income distribution, thereby ruling out the major risks of trade liberalization. Negative outcomes after several trade liberalization experiences in the 1990s have been associated precisely with failure to appreciate these risks. First, income is assumed to accrue to a single representative household in each country bloc, thereby overlooking any distinction between wage earners and profit earners. The distinction is critical because individuals’ spending behaviour is closely related to the source and amount of their income. For the economy as a whole, a higher concentration of income in the hands of profit earners leads to an increase in total savings and a reduction in spending, with adverse consequences for growth and employment. Secondly, the model assumes that income distribution follows the “productivity rule”, according to which real wages increase at the same rate as productivity. If this were really the case, the share of labour incomes in total income would be stable over time. Instead, the labour share has been decreasing in the US since the mid-1970s, and it has been far from stable in other TPP countries. Finally, the Tufts team concludes, CGE modelling takes for granted a rosy connection between foreign direct investment (FDI) and economic growth that is not empirically justified. So, I asked Parker yesterday, did MFAT still use CGE modelling to arrive at its current estimates? Hmm. Really? Is that happy response to market signals what really happened in the wake of the Rogernomics reforms ? Did those displaced from manufacturing jobs quickly find employment in high tech industries, and without any lingering harm done to the health and wellbeing of the people and communities affected? Not quite. As the MFAT report concedes in the very next breath: “ the adjustment can be relatively slow, with a degree of unemployment persisting in some areas.” You don’t say. The argument isn’t about the value of trade per se. We are a trading nation. It is about whether this deal – and the fish-hooks it contains – is really in the best interests of any but a relatively small number of New Zealanders. As things stand, the agreement will be signed on March 8 in Chile – all up, the select committee process for public submissions, the report back to Parliament and the legislative changes required will all mean, Parker indicated, that the CCTPP deal is unlikely to come into effect until early next year. Footnote : As has been widely reported, many of the contentious measures in the original TPP deal have merely been frozen, pending the possible re-entry of the US at some point in future. In that sense, the current safeguards – about the costs to Pharmac of (a) extended patent terms for biologics before generic substitution, and (b) transparency processes – are all only provisional. As Parker confirmed yesterday, even some of the ISDS safeguards won recently belong in this category of ‘frozen’ provisions – “they’re a combination of suspensions and the bilateral carve-outs” – so US re-entry would indeed alter the tally of these safeguards, if US re-entry was allowed to re-activate the original text. 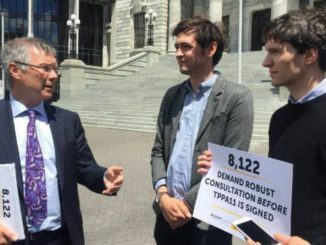 As yet, there is no clarity about the procedure for how the CCTPP members – and a future New Zealand government – would go about managing and authorising a US re-entry to the deal. Since the models say the deal is worth more with the US back on board, member governments can’t be relied on to defend us against say, the threat to Pharmac, the term of copyright etc clicking back into place.